The tech giant has come full circle on the dividend front. Technology companies were slow to embrace the power of dividends, choosing instead to reinvest their capital to grow their businesses more quickly. Microsoft (NASDAQ: MSFT) in particular held out from paying regular dividends for the first 16 years of its existence as a public company, despite the fact that its Office and Windows software products generated huge amounts of cash flow. In recent years, though, Microsoft has worked hard to boost its payout, and the tech giant now has a respectable dividend yield that compares well with its closest peers. Below, we'll take a closer look at Microsoft's dividend history. Microsoft paid its first dividend in 2003, amounting to $0.08 per share. The company originally intended the dividend to be an annual one, and it accompanied what turned out to be Microsoft's most recent stock split. At the time, then-CFO John Connors stated that "declaring a dividend demonstrates the board's confidence in the company's long-term growth opportunities and financial strength," and he noted that the ability to return profits "while maintaining our significant investment in research and development and satisfying our long-term capital requirements" was a solid accomplishment. Yet dividend investors weren't terribly excited with the token payment, which amounted to a dividend yield of just 0.3%. In the following fiscal years, however, Microsoft quickly moved to ramp up its dividend payments. In late 2003, Microsoft doubled its annual payout to $0.16 per share. The tech giant moved forward in July 2004 with a more conventional plan of making quarterly dividend payments, and the $0.08 per share payout every three months finally brought the stock's yield above the 1% mark. In addition, the company announced a major capital return program that included a special $3-per-share, one-time dividend payment, which investors received in Dec. 2004. After that, Microsoft started to grow its dividend gradually over time, following the trend of other stocks in the market, especially technology companies. Since 2006, Microsoft has boosted its payout 10 times, with increases coming annually except in the immediate aftermath of the financial crisis of 2008 and 2009. The growth rates in Microsoft's dividend have been impressive. After starting off with penny-per-share increases that represented double-digit percentage moves upward, Microsoft accelerated its dividend growth with increases of 18% in 2008, 23% in 2010, and 25% in 2011. The following years showed continuing strength, including raises of 15%, 22%, and 10% in 2012 to 2014. The most recent increase of a nickel per share in 2015 brought the payout to $0.36 per share, representing a 16% rise and bringing Microsoft's yield to 2.8%. What's ahead for Microsoft's dividend? Microsoft has plenty of capacity to implement future dividend increases. One recent cause for concern is the fact that its GAAP earnings per share have fallen by roughly half since fiscal 2014. However, most of the hit to Microsoft's bottom line has come from restructuring charges, asset writedowns, and goodwill impairment charges related to its acquisition of phone-related assets from Nokia. When you back out those extraordinary items, Microsoft has typically earned about twice what it's currently paying in dividends. A payout ratio of just over 50% should allow for several more double-digit percentage increases in the dividend in the coming years for Microsoft. In the long run, much depends on whether Microsoft's growth initiatives are successful. The company has a history of making acquisitions aimed at growth that haven't panned out as well as hoped, and the recent announcement of Microsoft's $26 billion purchase of LinkedIn has left many analysts with an unsettling feeling of deja vu. However, Microsoft has had promising early results from its drive to move toward a subscription-based model for its software. More than 70 million workers use its Office 365 service monthly, and in particular, consumer subscriptions of more than 22 million point to the popularity of the productivity software suite. Similar initiatives to spur more revenue from Windows, cybersecurity products, and cloud service have shown promise as well. 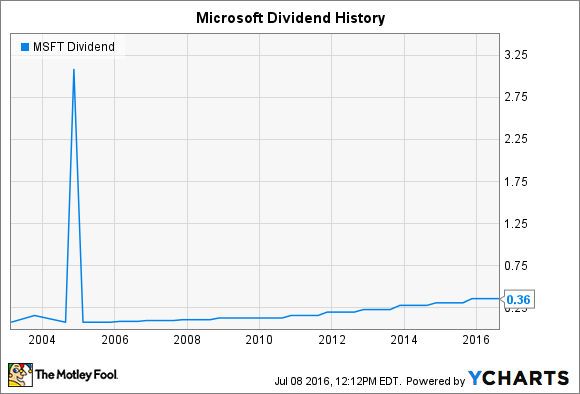 Microsoft's dividend history isn't all that long, but the stock has gone from being irrelevant to income investors to becoming a lucrative dividend payer. If the company can keep its fundamentals strong, then dividend investors can look forward to more payout increases from Microsoft in the future.